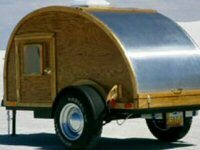 Teardrops n Tiny Travel Trailers • View topic - What do you think about fiberglass panels? What do you think about fiberglass panels? I could cut the 8 foot length to 5 foot and lap the panels together on the roof. Does anyone know of a good, clean-looking weathertight way to make a fiberglass panel lap joint? Interior vs. exterior? I think these have been done over a few times here. I don't think they are UV resistant. Better check for exterior. Check around for FILON which is a fiberglass reinforced polyester FRP. This is what they use on commercialy built RVs and is UV Resistant. I know that people have used the HD panels on their TDs but they painted them to protect them form the UVs. 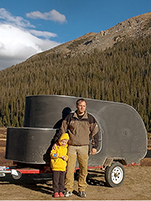 Re: What do you think about fiberglass panels? If you're going for a lap joint, why not use epoxy. I love that stuff. We have some tears made by folks on the forum that used the product you are talking about, hope they respond here and tell you about it. If that is what you want to use, don't let anyone talk you out of it. UV issues can be taken care of with paint if need be. Last edited by PaulC on Sun Sep 24, 2006 4:06 am, edited 1 time in total. Time is the only real capital we have. Money you can replace but time you cannot. We have used those panels you speak of in remodeling bathrooms. Be careful they can be tricky to cut. Good grief, isnï¿½t it the weekend yet? I flushed things up with a laminate cutting bit in my router.